Namaste; Join Dre' as she discovers authentically Indian food at a quaint spot on Parliament Street (Nassau,Bahamas), Taj Mahal. The manager, Manjit helps her to discover the complex spices and subtle flavors that are associated with Indian foods and serves her a feast like we have never seen before! Explore authentic Indian curry, lamb, spinach, cauliflower, Marsala, and more. The Bristol Wine & Spirits "Wine of the Week" recommended for Indian food by Rusty, is a Lindeman's Bin: Pinot Noir. Click PLAY for another awesome adventure in taste. Watch the show HERE on Youtube. 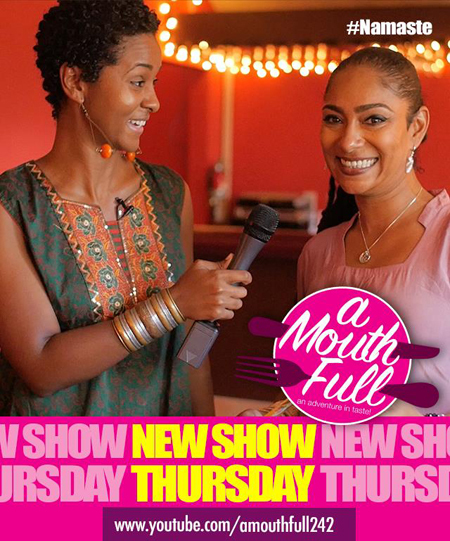 A Mouth Full is the first of its kind in Bahamian television, entertaining and educating Bahamians and visitors alike about the variety and complexity of the food landscape here in our 700 island archipelago. A Mouth Full's host, Dre visits local restaurants, take-aways, ‘holes in the wall’, and households to taste, try and create all the foods available here in the country. New episodes (10 mins. each) of A Mouth Full are released every 2 weeks on a Thursday online, and the show also airs Wednesdays at 9pm on CABLE 12. Each season offers 8 episodes and we have 2 seasons each year. A Mouth Full is produces by IKONZ Media and is sponsored by Bristol Wines and Spirits, BTC, Islandbreak. Promotional sponsors include The Bahamas Weekly, Bahamas Local, and Bahamian or Nuttin.